With more and more individuals becoming aware of holistic and alternative treatments for their healthcare, it is not too surprising that castor oil eye drops are making their way to the “mainstream”. In fact castor oil as a whole seems to be gaining in popularity with its unlimited uses and health benefits. But before you go applying some castor oil into your eyes, it is important to be well educated about the specific uses for this substance, along with when it is best to apply, when it should be avoided, and of course how to apply the oil safely. The thought of applying a thick, viscous oil directly into the eyes may sound a bit unusual and even scary to some people. However when used properly and in the right context, castor oil eye drops are very safe, gentle, and effective for a wide range of eye disorders. With this in mind, one must take great care in making sure the castor oil that is being used is 100% organic, hexane-free, and sterile. It can be cold-pressed or expeller-pressed, as these are both viable options for using as an eye treatment. With this high-quality source of castor oil, you will want to place it in a sterile, glass dropper bottle ideally 1-2 ounces in size. I do not recommend using a plastic dropper bottle or reusing any bottles. Once you have found a high-quality and reliable source of the castor oil, you then have to determine if this is an effective treatment option for your particular eye disorder. Luckily, castor oil is so versatile it often is used to treat just about all disorders of the eyes. The greatest success I have seen personally with its usage is for treating dry, red, and itchy eyes. For this issue, its healing benefits can often be felt instantly with the first application. Castor oil can also be very effective in treating more severe issues such as cataracts and glaucoma, but please keep in mind that these are considered more severe and chronic disorders and therefore it will take a bit longer to notice any changes taking place (the timeframe will vary for each individual). Purchase our 100% Organic, Hexane-Free Castor Oil Eye Drops here! Just as there are many uses for castor oil eye drops, there are also a handful of reasons to avoid this treatment. Once again this will be an important consideration when determining if the castor oil eye drops are the best option for your eye care needs. If you have read this list of contraindications above and you still feel like the castor oil eye drops are a good match for your needs, then the next step is to make sure you are applying the eye drops in the most safe and effective manner possible. So let’s move on to a quick run-down on how to apply the eye drops! Always make sure the eyes are clean, dry, and makeup-free before application. Castor oil should not be applied before or while wearing contact lenses, or simultaneously with other eye drops (see above for more details). The sterile, organic, hexane-free castor oil should be contained in a small glass dropper bottle (also sterile). Plastic droppers should be avoided, as should any dropper that is not 100% sterile. Before bed is the best time for application. This is because the castor oil is quite thick and will leave a residue after application. When applied at night, this can be rubbed in rather than wiped off. For more severe issues, this dosage may need to be applied upon awakening as well. 1. Tilt the head back slightly and apply 1-3 drops directly into each eye, aiming to get the oil to cover the entire eye. Once applied, blink the eyes a couple times. 2. After application, close the eyes and gently massage on and around the eye. Allow the oil to penetrate and avoid washing the eye. 3. If the outer eyes are too oily, dab with a piece of tissue to remove any excess oil around the eye. It is recommended to leave a bit of the oil to soak into the eye and around the eye. 4. Always wait 8-12 hours to apply any other eye drops or to wear contact lenses. 5. Use on a consistent, nightly basis for the most effective use! **For dry, itchy, and red eyes, feel free to apply the castor oil eye drops as needed during flare-ups for instant relief. **For anti-wrinkle treatment, you can avoid placing the drops into the eye (unless otherwise desired) and simply massage several drops around the eye. Do not remove the oil after application, and allow it to penetrate completely. Apply each night before bed. As with any substance, castor oil can be a powerfully healing medicine or an unwanted irritant. One must always use proper knowledge, guidance, and research in order to establish if the castor oil eye drops is the proper medicine for your specific needs. Although castor oil eye drops can be very gentle, safe, and effective in treating a wide range of eye disorders (I use them regularly myself), it can also cause irritation to others. In this sense one should always listen to their body and go with what is working for them rather than what the general census says. 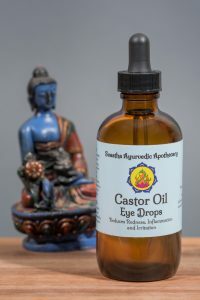 With all this being said, I have seen the castor oil eye drops heal and treat a wide range of eye issues first hand (even issues that western medicine had failed to treat). Therefore as long as the individual is using the proper precautions (as stated above), I highly recommend giving them a try! *For more severe issues or previous eye surgeries, one should always consult with their doctor before using the castor oil eye drops. Great article! I was not aware that castor oil eye drop has so many uses. I really like the info provided by you. Thanks for sharing the wonderful article. If you do have a problem and the eye is irritated, what do you do? How do you clean it out of your eye? Thanks for writing in! Luckily the castor oil should only cause a very mild irritation if this does occur. You can simply blot the eyes as much as possible with a dry and clean tissue to begin. If this isn’t enough, you can flush the eyes with warm water and then repeat the blotting with a dry, clean tissue. In the case of castor oil eye drops, I have not seen much of a different between the two. I have had good results with both, so I would just go with whichever you prefer. The most important factors you will want to look out for are organic, sterile, therapeutic quality, and hexane-free castor oil. Hope this helps! Where can l find the organic castor oil eye drops? Will any organic castor oil work? I am trying to avoid cataract surgery. Please reply. You can find organic castor oil eye drops online at naturaleyecare.com. If you prefer to make your own, most organic, high-quality, hexane-free castor oil will do. Just make sure the glass (not plastic) eye dropper bottler is completely dry and sterile before adding in the castor oil. I often use castor oil from Mountain Rose herbs or Aura Cacia and have had good results with both. Once you are ready to apply, make sure to follow the directions and precautions stated above and you should be good to go! When you wake up in the morning after dropping in your eyes at nighttime, do you rinse your eyes with warm water? I m not comfortable for using the eye dropper. Can I massage castor oil on the eye around instead of eye dropper? Would it still work well? Massaging the outer eye and eye lashes with the castor oil is a great way to introduce the oil into the eye without being so “invasive”. This is a good method for minor issues such as dry eyes, but if you are aiming to treat a more severe condition such as cataracts or glaucoma, then I would suggest eventually applying the oil into the eye once you feel more comfortable. My uncle has glaucoma. Should he consult with his doctor before using since he’s on a prescribed medicated eye drop? This is a very common question when it comes to castor oil eye drop use. With any serious eye condition, one should always consult with their doctor before using; this is even more important if one has had a previous eye surgery or is on a prescription eye drop medication. In general we advise to avoid using castor oil at the same time as any other eye drops (including OTC eye drops); if other eye drops are needed, one should always allow an 8-12 hour timeframe between the castor oil application and using the other eye drops; if any irritation occurs, the castor oil should be discontinued. Thank you for asking! Is CO effective in treating cataracts in animals, ie. Chihuahuas? Yes! Castor oil eye drops can be a great remedy fro treating cataracts, even in animals. I have had clients and customers whom have reported positive results after treating their dogs with this remedy. Thanks for the great question! Is cater oil safe to use after laser treatment for a retina tear I had 7 months ago? We typically advise not to use castor oil eye drops directly after eye surgery. We recommend waiting at least one month but this time can vary from person to person. It would be best to consult with your doctor before considering castor oil eye drops. Thank you for asking! kindly provide details where i will get pure castor oil in india. Castor oil eye drops and castor oil is essentially the same thing although not all castor oil is the same. It is very important to choose a high-quality castor oil if you plan to use it on the eye. Make sure you choose a castor oil that is 100% organic and hexane-free. It can be cold-pressed or expeller-pressed, as these are both viable options for using as an eye treatment. With this high-quality source of castor oil, you will want to place it in a sterile, glass dropper bottle ideally 1-2 ounces in size. Unfortunately, I have not done any research on suppliers in India. The company I recommend is not shipping internationally at this time. When searching for castor oil in India, just be sure to follow the criteria as mentioned above to make sure you get a high-quality product. Thank you for your interest! Unfortunately, we are no longer selling this item on our website. I do not know of anyone else selling castor oil eye drops at this time. I have been recommending Mountain Rose Herbs as a good source for castor oil. 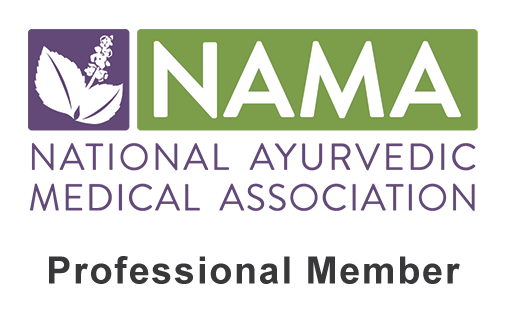 I have had much benefit myself with this brand and many success stories from my clients. You can find it here: https://www.mountainroseherbs.com/products/castor-oil/profile. They also sell small glass dropper bottles if needed. Always be sure to sterilize the dropper bottle before filling it up with castor oil. Thank you for your interest in castor oil eye drops! You advise using a sterile, glass dropper bottle and to avoid using a plastic dropper bottle. I just purchased some Aura Cacia brand Castor Oil and came in a plastic bottle–should I return it, and and pursue a castor oil in a glass container? Thank you for your question. There is no need to return the oil. Many oils are stored in a plastic container before we purchase them, even when sold in glass bottles. I would simply recommend transferring the castor oil to an amber glass dropper bottle and storing it in a cool, dry place out of direct sunlight. Let me know if you have any further questions! How long should I use castor oil eye drops for the prevention of glaucoma? I am using it to keep my eye pressure down before my next eye appointment in 6 months. I want to see if it is making a difference. As long as it is not irritating my eye, can I use it for the next 6 months once a day? Yes, you should be able to use the castor oil for the next 6 months as long as you do not experience any redness, irritation or other unwanted side effects. These side effect would typically occur straight away if they are going to happen, but sometimes they can come on later. If the oil continues to be soothing however, there is no contraindications for applying the oil longterm. Of course I always recommend letting your doctor know, especially if you are using any prescribed eye drops. Can you suggest the best brand of castor oil for my eyes and where it can be purchased? Mountain Rose Herbs sells castor oil that is 100% organic and hexane-free. You can find it here: https://www.mountainroseherbs.com/products/castor-oil/profile. They only sell it in bulk so you will have to pour it into a glass dropper bottle in order to easily apply to the eyes. You will want to ensure that you properly sterilize and dry the dropper bottle before filling it, as they do not come sterile. Can I use Jamaican Black Castor Oil? Thank you for your question. I do not have any experience with this type of castor oil, so I am not sure on the answer. I would assume this variety may possess different properties and therefore I would ultimately suggest that you stick to the basic castor oil (organic, etc), especially when using it as an eye drop. Thank you! This information has been quite helpful, however I was wondering how long should I use this treatment. Other articles say 3 months, but what then? After that time am I done for good or do I need to take a break and then restart gain? This is a great question. Unfortunately it really depends on the individual and the severity of their eye care issues. With more chronic issues such as glaucoma and cataracts one should use them longterm, while a person treating dry, itchy eyes may only need to apply for a couple weeks. In fact the former should apply daily while the latter may only need to apply as needed. Castor oil is safe to use longterm (even beyond the 3 month period) with the eyes as long as redness, irritation, blurry vision or any other unwanted side effects do not come up. Of course one should always let their doctor know when treating a more severe issue, especially if other eye drops are being used simultaneously. Although using the eye drops longterm is generally not contraindicated, it is always best to listen to your body and go from there. Great ! So Kindly Direct me to where I can purchase the eye drop quality. Thank you for reading my blog! As an Ayurvedic Practitioner, I have been using the organic castor oil from Mountain Rose Herbs. I have had much benefit myself with this brand and many success stories from my clients. You can find it here: https://www.mountainroseherbs.com/products/castor-oil/profile. They also sell small glass dropper bottles if needed. Of course you will want to ensure that you properly sterilize and dry the dropper bottle before filling it, as they do not come sterile. Otherwise this should be very beneficial. I hope this finds you well:) Please let me know if you have any further questions! I thought we suppose to have the organic cold pressure, hexane free, and glass dark bottle instead of clear bottle?? They only sell it in bulk so you would have to pour it into a sterile, amber glass dropper bottle ideally 1-2 ounces in size. I do not recommend using a plastic dropper bottle or reusing any bottles. I hope this answers your question. Can castor oil treat/cure eye floaters? Thank you for asking. 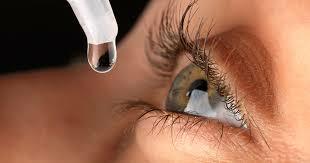 I have had a few customers report that the castor oil eye drops helped with their eye floaters. There is never any guarantee but it is definitely worth trying! About a month ago I purchased Castor Oil Eye Drops from your company. I have 3 Chihuahuas with Cataracts. & was unable to blink. The other eye was also advanced but not as bad. One month later, she is able to blink with the bad eye & you can see the cataract is thinner. The other eye has improved & she is moving about more freely. I have started my other Chihuahuas also. Are these eye drops still available thru your company? Interested in purchasing another bottle. That is so wonderful to hear that you are seeing such positive results with the castor oil eye drops on your dogs. Unfortunately we are no longer selling this item. If you are looking to purchase more castor oil, it is available through Mountain Rose: https://www.mountainroseherbs.com/products/castor-oil/profile. You have to buy it in bulk and then pour it into a sterile bottle with a dropper cap. Thank you for sharing your story. My eyes got dry after laser treatment for spectacles removal 17 years ago. I am struggling with my dry eyes. In previous 6 months my dryness increased a lot. Can I use caster oil for my dry eyes. I am using Hylo-Comod Lubricating Eye Drops. Can I use castor oil with this eye drops ? Castor oil has shown to be very effective for dry eyes. Before considering this as an option, you will want to make sure to get a good quality castor oil. The castor oil should be 100% organic, hexane-free and sterile. Avoid using castor oil at the same time as any other eye drops (including OTC eye drops); if other eye drops are needed, one should always allow an 8-12 hour timeframe between the castor oil application and using the other eye drops. You could try using the castor oil in the morning and your other drops in the evening. If they are over the counter drops, you could try discontinuing them for a few weeks and just use castor oil in the AM and PM to see if you get better results. If your current eye drops have been prescribed by a physician DO NOT DISCONTINUE without first talking to your physician. Thank you for your question! That is a great question. Unfortunately not enough research has been done on the topic for me to provide an answer. I would consult your doctor before considering castor oil eye drops. Thank you for your post. I’ve tried it a couple of times and was left with my eyes feeling incredibly blurry and dirty the following day. I suffer from dry eyes and cataracts in my left eye. I’ve tried cleaning my eyes out with sterile water and artificial tear drops, but it doesn’t seem to help. My vision only returns to normal the following day. I cannot say if you are doing anything wrong for sure, but I do know that everyone reacts to the castor oil differently. Some individuals find great relief, better vision and less irritation while others experience blurry vision and more irritation as you are finding out. In these cases I always advise to go the safe route and discontinue using the eye drops. It is wise to listen to your body rather than how others have experienced it. I wish I had a better answer, but when dealing with the eyes it is always best to be safe! Thank you for your question! Pls can I use home made castor oil? Cos I made some last week, is it useful for my cataract? Thank you for your question. Yes, you can make your own eye drops at home. However, it is extremely important to use a high- quality, organic and hexane-free castor oil, as well as a sterilized and dry glass dropper bottle. Please carefully read over the information above for more details on how to do this. Thanks again! I can’t find Sterile Caster Oil. Do I sterilize it myself, (Like boiling milk)? Thank you for your question. Heating the castor oil in a pan on a low-medium heat would be one option for killing off any potential contamination of bacteria, etc. However, you will still have to make sure there are no particles of dust, dirt or foreign matter in the oil. If you put the oil in a sterile clear container such as a ball jar, you can examine it very closely. Since the oil is so thick, any small particles should be seen unless they are microscopic. I would make sure to find a high quality castor oil source and reach out to them in regards to their bottling process. I hope this helps! Hi one eye that was treated by surgery for a cataract several years ago and the other has a cataract not treated can use castor oil in both eyes? Thank you for your question. Many individuals have used the castor oil eye drops for their dry eyes after receiving the cataract surgery without any observed side effects. However, it is always best to consult with your doctor beforehand, since each individual is unique and will have different needs. If you do begin the eye drops, please wait at least 30 days post-surgery and monitor closely when you begin use them. I would recommend applying one drop only to the eye that has had the surgery. Another option would be to apply the eye drops to the eye that has not had surgery as normal, and then simply rub the castor oil around the eye for the other one. This massaging will allow trace amounts to absorb into the eye and still offer some relief and healing. I hope this helps to answer your question! Please let me know if you have any further questions or concerns. Can you use Castor Oil eye drops if you have artificial lense implants from cataract surgery? Thank you for your question! I actually get this question a lot, so I’m sure it will help many others as well. You should always use caution with the castor oil eye drops after receiving any lense implant in the eye. In large dosages, the castor oil has been shown to break down inorganic matter such as contact lenses. If you just recently had the surgery, I would avoid the castor oil altogether for a minimum of 30 days post-surgery. After this period, with your doctor’s consent, you can begin to apply the castor oil around the eyes before bed. This will still help the eyes, just through the close proximity of the oil application. If there are times of severe dry eyes (which often occurs after the implant), you can potentially apply one drop per eye, but only as needed rather than on a regular basis. Once again, it is always best to consult with your doctor before application when you have received any type of eye implant or surgery. any further questions or concerns! Has your company started selling Castor Oil Eye Drops again? My husband has been diagnosed with Fuchs dystrophy and early cataracts. Currently using Muro 128 5% OTC eye drops 4x a day. What is your opinion of using castor oil for the cataracts? I have heard mixed reviews on the efficiency of treating cataracts with the castor oil. Many customers have claimed it to help in reducing the prevalence of them, while several others have claimed to see no difference. Everyone is unique and will have a different level of severity, duration (meaning how long the cataracts have been present), etc. Plus no matter the substance, each individual will have a unique reaction to it. I have not heard of any negative effects when using the castor oil unless there was slight irritation or redness that occurred, in which it should be discontinued at that time. Since you are currently on prescription eye drops and need to apply them 4 times daily however, I would not recommend using the castor oil at this time. This oil is very thick and leaves a slight residue that takes a while to absorb fully. Therefore no other eye drop, prescription or OTC, should be used with the castor oil eye drops unless you allow a 12 hour window in between applications. Further, with more severe issues such as cataracts, it is always best to ask your doctor before beginning any complimentary treatment. I have used the only thing I could find and it was not organic, but it does say it is USP and it does say everything else. What is the difference between organic and USP? Thank you for writing in with your questions! I would ultimately suggest to find an organic source for your castor oil. This ensures the best quality and a pesticide-free, non-GMO oil. That brand is likely to be a better quality since it is approved by the USP, however, this does not make it pesticide-free necessarily. 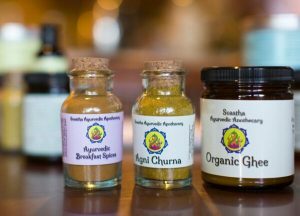 Of course some smaller companies such as ours here are organic but not certified due to the high costs of this service. So it may likely be a good source for the eyes; I would not assume anything though. Your best bet will be to contact the company personally and ask them their source and quality for the castor oil. As for your brother, I would have to say that he should avoid using the castor oil in his eyes. There is just not enough studies done using the application of the oil onto an eye with no lens. It could be helpful, but castor oil if fairly strong at breaking down tissue and it could also do damage overtime. He could always use the castor oil by massaging it onto the eye while it is closed (once each night before bed). Have him keep the oil on and a small amount will seep into the eye without being excessive or damaging. This should be safe for him and be beneficial for the eyes. Of course if any redness, irritation or unwanted side effects arise, have him discontinue the use of them immediately. For the woman who use the castor oil in her dogs eyes, how did she apply it? drops in their eyes, or rubbing around their eyes. Thank you very much.